This self-study guide begins with a discussion of terminology and concepts important to understanding the awarding process for both grant programs. Building on this foundation, the next two lessons show how to select the correct formula to calculate awards and illustrate the calculation process. The guide concludes with a discussion of additional considerations, including the treatment of summer terms, awarding transfer students, and recalculations. Be able to define key terms and concepts impacting Federal Pell Grant and IASG eligibility. 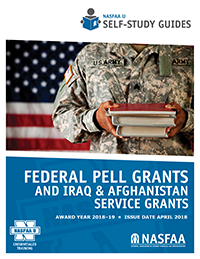 Know how to calculate a Federal Pell Grant or Iraq and Afghanistan Service Grant award for a term-based program. Understand how to calculate Federal Pell Grant and IASG using the appropriate formula. Understand how other factors can affect Federal Pell Grant and IASG processing.